In fifth pAsuram – AzhwAr elaborates emperumAn‘s sarvasajAthIyathvam (being born in all species) saying “emperumAn would mercifully incarnate as hayagrIva et al to protect the universes created by him”. Subsequently, AzhwAr mercifully explains the unique nature of the many incarnations assumed by emperumAn who is the cause of all to protect the result of his creation. Fifth pAsuram. AzhwAr explains previously highlighted thiruvAimozhi 2.8.1 “iNaivanAm epportkum” (would be born among all species). emperumAn is the effortless singular cause who does not expect anyone’s help of the created universe which consists of creation that gives continuous (without break) by binding the AthmA to birth and others including sustenance, annihilation etc and all other activities, is the protector and the lord for those nithyasUris who are beyond the reach of the dhEvas (celestial beings) starting with brahmA et al and is like a river bank that is easily approachable by me. Such emperumAn (for the protection of such universe) incarnates as hayagrIva (horse-headed form, who is the propagator of vEdham), as kUrma (tortoise) and mathsya (fish) (who are propagators of purANas) and also incarnated as human form (who is the propagator of gIthOpanishadh – bhagavath gIthA). This pAsuram elaborates thiruvAimozhi 2.8.1 “iNaivanAm epportkum” (would be born among all species). OvAth thuyar piRavi utpada … – Before he said in thiruvAimozhi 2.8.2 “nIndhum thuyarp piRavi” (sorrowful birth etc which are difficult to cross-over); here he says – it is not just something that gives us opportunities to recoup and escape – it is those six aspects (jAyathE – birth, asthi – existence, pariNamthE – change, vivardhathE – growth, apakshIyathE – decay, naSyathi – disappearance) and the objects of such aspects which cause continuous sorrows. mUvAth thanimudhal – mUvA – without laziness, effortlessly; this is explained as adjective for both “OvAth thuyar piRavi utpada” and “thani mudhal“, that is, bhagavAn being the singular cause without laziness for these six aspects that goes on eternally in continuity (pravAha rUpaththAlE nithyam) and being the effortless singular cause of these entire creation. Though emperumAn gives body/senses to AthmAs to facilitate them to worship him, if they misuse the tools, he would think “if they do like this, let me develop their taste towards me over time”, will allow them to continue in their path and be neutral/indifferent towards them; Thus, even if they digress from his own desire (of accepting all of them), like a farmer who would try growing crops again and again instead of giving up, he keeps engaging in creation again and again. This is explained in periya thiruvanthAdhi 18 “sOmbAdhu ippal uruvai ellAm padarviththa viththA” (without laziness, you who is the original cause who created this universe that has variegated aspects). What is he creating and protecting? 3 layers – Lower layer (seven planets below bhUmi (earth) – athala, vithala, …, pAthAla), middle layer (Earth), upper layer (six planets above earth – bhuva:, svarga, maha:, jana:, thapa:, sathya). 3 types of planets – kruthakam (3 planets below mahar lOkam – bhU: (earth), bhUva:, svarga) – these are recreated as part of each manvanthra (life of manu – 71 chathur yugams approximately), akruthakam (3 planets above mahar lOkam) – jana:, thapa:, sathya – these remain undisturbed even during the dissolution of a manvanthra, kruthAkruthakam (maharlOkam) – this gets recreated at a lesser frequency [during the beginning of brahmA’s day which contains 1000 chathur yugams] [Here the context of recreation is within the boundary of brahmA’s one day]. kAvalOn – Protecting by propagating SAsthram etc. Does he protect without minimizing his supremacy? mAvAgi … – akarmavaSya (one who is not bound by karma) being born amongst/like karmavaSya (one who is bound by karma). 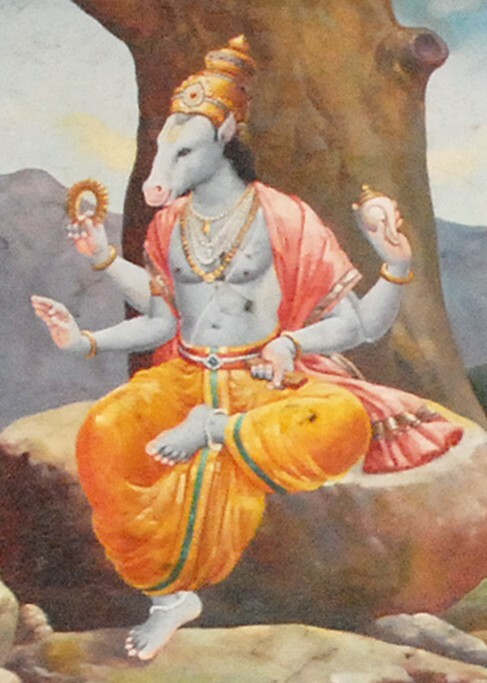 mAvAgi – incarnated as hayagrIva mUrththi (horse headed form). AmaiyAy mInAgi – incarnations that are focussed on revealing sacred/true knowledge. mAnidamAm – incarnations such as SrI rAma, krishNa et al. As explained in SrI rAmAyaNam sundhara kANdam 35.11 “maryAdhAnAm cha lOkasya karthA kArayithA cha sa:” (That SrI rAma is the epitome of maintaining honor/dignity and one who engages others to be honorable/dignified) and in bhagavath gIthA 3.21 “yadhyadhAcharathi SrEshta: …” (whatever performed by great person, common men will follow…”. Who is the person who makes himself available in such mortal forms? dhEvAdhi dhEva perumAn – He is beyond the reach of nithyasUris who cannot handle the smell/acquaintance of dhEvas (celestial beings) who cannot annot handle the smell/acquaintance of humans. pure – emperumAn who has the purity to purify me; he changed my desire from worldly matters towards him (I was like those who desire for cheap foods when most delicious foods are available). easily approachable – he is like the banks of a river where we can step in and immerse. This entry was posted in thiruvAimozhi, thiruvAimozhi 2nd centum on May 31, 2016 by Sarathy Thothathri.